“We have already got some assistance from our friends in the international community,” he said in a televised address. 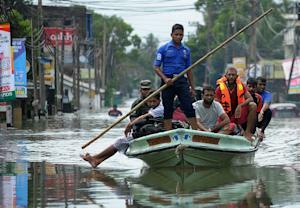 The national Disaster Management Centre (DMC) said 21 of Sri Lanka’s 25 districts had been affected. Around 300,000 people had been moved to safe shelters while a further 200,000 were staying with friends or family. “Our information is that about half a million people have been driven out of their homes,” Finance Minister Ravi Karunanayake told reporters. “We started moving to higher ground as the water level went up and then we found we had no other place to go to,” the mother-of-two told AFP in Colombo’s Kolonnawa suburb. Private taxi hailing company PickMe added an “air lift” button to their app so that marooned users can give their coordinates to the airforce. It was not clear how many had used the free airforce lift. Sri Lanka’s cricket team, who are on tour in England, announced a donation of one million rupees (around $7,000) for victims and wore black armbands during the first Test at Headingley. The worst-hit areas were in Colombo’s northeastern suburbs along the Kelani river, which began bursting its banks on Thursday evening. A local police officer said 144 people, including 37 children, had been reported missing since Tuesday’s landslides. “We can’t definitely say if all these missing people were actually in their homes at the time of the disaster,” said the officer, who asked not to be named.